While most of my clients utilize DITI (Digital Infrared Thermal Imaging) for breast imaging, there are actually many uses of this technology. I was asked recently to present to a group called Mended Hearts in Tucson. This organization is made up of people who have had cardiac events of some type. They meet to support those who may be facing heart surgery, a diagnosis of coronary artery disease or some other cardiac condition. Prior to this presentation, one of the group members asked if DITI could monitor for heart disease or detect cardiac problems before someone suffered a heart attack or worse. As it turns out, DITI is wonderful at monitoring full body health, including cardiac function. In the American Journal of Cardiology, 1993, a study was done to determine if DITI could detect and help with management of coronary artery disease (CAD). Two questions were posed and tested to find the answers. The first question was simply: Do people with coronary artery disease (CAD) have asymmetrical patterns across the chest region? Remember, DITI is used to compare thermal patterns and temperatures on the body and where there are asymmetrical findings is where further investigation should take place. This idea of asymmetry on the body when disease/dysfunction is present is actually based on something Hypocrites determined many, many years ago. He put wet mud on his patients and the areas that dried first or that dried faster than the contralateral region was where he found disease. So the question posed in the study, “Is there asymmetry in the precordial (chest) region in patients with CAD?” is deeply grounded in medical history. The first image to the left may answer the question even for the untrained eye. As you can see, the left chest region on this male client is hypothermic (cool) in comparison to his right chest region. This type of thermal finding is consistent with cardiac dysfunction and further testing revealed this male client had CAD. Here is another example of that suspicious finding of hypothermia over the heart region. This again was determined to be due to CAD after DITI detected this asymmetry. However, due to the breast tissue of women, testing for cardiac function is not as easily seen and additional images need to be taken for a full thermographic assessment of cardiac function. See if you can determine where there is thermal asymmetry in the images below. 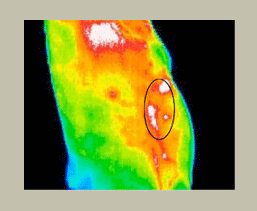 The anterior view may show you slight thermal asymmetry on the left breast due to a linear pattern of hyperthermia (red line) in the inner quadrant of the left breast. ...can you find the asymmetry seen between the lateral left and right views? Look for hypothermic (cool colors) patterns when you compare both views. If you can see the blue region over the lateral left thoracic region compared to the right lateral thoracic region, you could be a thermologist in training! The thermologist’s findings noted that this asymmetrical pattern is suspicious for cardiac dysfunction and further testing was recommended. Ladies, realize that your cardiac function is also assessed with each of your thermal breast scans. You may not realize this unless there is a suspicious finding, but cardiac and pulmonary function are assessed with each breast scan and more than just breast health is being evaluated. 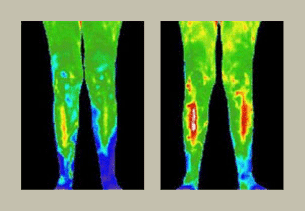 So the study in the American Journal of Cardiology found that the answer to their first question about thermal asymmetry is a resounding YES – thermal asymmetry is seen 94% of the time in those with significant coronary artery disease. Heart disease is one of the top killers in our country and unfortunately, in about 50% of the cases of CAD, the first symptom is a fatal heart attack or sudden cardiac death. I have several friends whose fathers passed away suddenly due to cardiac arrest and of those fathers, many had been given a clean bill of health by their PCP just prior to their passing. Carotid Artery Screening (head/neck): Those who are diagnosed with CAD or are scheduled for surgery (bypass) are told to have a carotid ultrasound because disease or blockages in the heart may also be found in other arteries. This woman had further testing that revealed a right carotid occlusion (blockage). Along with screening for occlusions, my thermologists look for increased thermal activity in your carotid arteries and IF they find this, they suggest you have a C–Reactive Protein (h/s CRP) test to measure the amount of inflammation in your body. Elevated CRP AND lots of thermal activity in your carotid arteries shows a STRONG correlation to the early development of CAD. Chest/Breast Imaging: Naturally, this region is imaged for women who come in annually for comparative studies. Please know that the woman who shows thermal asymmetry on the lateral left compared to her lateral right side (breast images above) was just in for her annual breast scan. I know that a few of my clients prefer to come in every 2 years and I strongly encourage you to re-examine this decision. Breast imaging is NOT like mammography which simply looks for a tumor/calcification. Mammograms have their place, but a positive mammogram offers NO opportunity to intervene early with diet and lifestyle changes as it is not a preventative screening tool. Also, mammograms do NOT offer cardiac or pulmonary function assessment or lymphatic congestion, hormonal imbalances, neovascularity screening. . .all which contribute to poor health and increase risk for disease development. Abdominal Imaging: Often, someone with Congestive Heart Failure also has a congested liver so imaging this region may help guide further testing and/or healing modalities to consider. Also, imaging this region can help rule in/out GERDs as the symptoms can sometimes be similar. Kidney function plays a big role in blood pressure regulation, so imaging of kidneys is done with abdominal scans, too. Lastly, we would want to do a leg scan looking for peripheral artery disease (PAD) as that too is a concern for those with CAD. As you can see, using DITI to assess cardiac function is a great idea and having your annual breast scan to detect any suspicious findings is a great start. However, if you want to use DITI to help detect early signs for the possibility of developing CAD, you would want more than just the breast scan. A full body and breast/chest scan is needed. As always, we welcome your questions and comments and encourage you to post them here or on our Facebook page! Frankenfoods: We Have the Right to Know! A. Require labeling on raw or processed food offered for sale to consumers if the food is made from plants or animals with genetic material changed in specified ways. B. 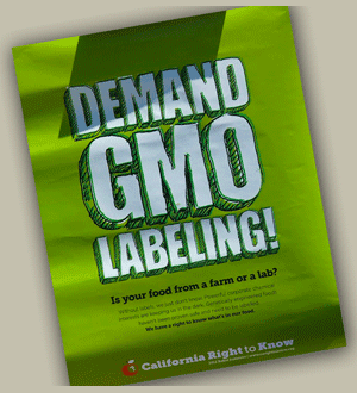 Prohibit labeling or advertising such food as "natural." C. Exempt from this requirement foods that are "certified organic; unintentionally produced with genetically engineered material; made from animals fed or injected with genetically engineered material but not genetically engineered themselves; processed with or containing only small amounts of genetically engineered ingredients; administered for treatment of medical conditions; sold for immediate consumption such as in a restaurant; or alcoholic beverages." A similar attempt to require the labeling of genetically modified foods in 19 other states has FAILED. There is a lot of information about the Proposition and you can read more about it as well as see the supporters and opponents of this measure at Ballotpedia.org. Type "Proposition 37 2012" in the search bar. This video is available for free viewing online between September 15-22! Occasionally, the topics for my newsletters -- and now my PHS blog posts -- come from repeated questions that come from clients during the month. Other times, they are sparked from my personal desire to educate or remind clients of the benefits of thermal imaging in monitoring health. This month's newsletter and blog are somewhat pre-emptive in that "Pink-tober" is right around the corner and we are about to be inundated with messages about the benefits of early detection and marketing campaigns that promise to donate a portion of the proceeds to support Breast Cancer Research. Pinktober is of course, the month of October and you not only begin to see the pink washing of items in the grocery stores, but you will hear (ad nauseum) about the benefits of mammography. However, there are risks associated with mammography that you may NOT be aware of. 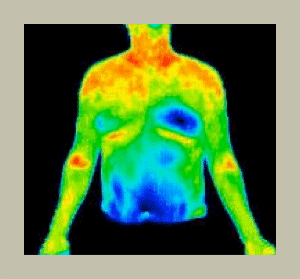 Unfortunately, thermography (a functional test) cannot replace the use of mammography (a structural test). My goal in sharing this information is to possibly inform you about the risks that you may not know about. My hope is this will empower you to decide at what interval of time it's best for YOU to use mammography with annual thermography. Can compare previous thermograms against an established baseline. If there are worrisome findings, you have a chance to make changes to address lymph congestion, hormonal imbalances, fibrocystic changes, and/or new vascular patterns that may relate to breast disease developing in the future. Looks for physiologic changes that precede disease thus allowing you time for intervention and lifestyle examination. Is not a preventative method for staving off breast cancer and is used to look for calcifications and/or lesion/tumors that have yet to be found by self or clinical exam. Offers no opportunity for prevention once a tumor is found. On average, a tumor takes 6-8 years to develop into a size large enough to be seen on an X-ray and once discovered, there could be as many as 4 billion cancer cells for your immune system to battle. In summary, thermography cannot replace mammography and there are no claims to suggest this. Sayer Ji, founder and editor of GreenMedInfo.com and author of How X-Ray Mammography is Accelerating the Epidemic of Breast Cancer, writes a concise and powerful report about this topic so rarely discussed in our medical arena. I encourage you to read the full report. Below are some salient points about his findings. British Journal of Radiobiology 2006 - article revealed that the type of radiation used in X-ray based breast screening is much more carcinogenic than previously believed as compelling evidence demonstrated that the low-energy X-rays used in mammography are about 4 times - but could be as much as 6 times- more effective in causing mutational damage than the higher energy X-rays. The above finding notes that since the current radiation risk of mammograms is based on high-energy gamma radiation it thus implies that the risks of radiation-induced breast cancer for mammography X-rays are also underestimated by the same factor. While this seems counter-intuitive, the truth is that low-energy (often called "low-dose") X-ray used in mammograms is more dangerous than high-energy X-ray like those used in a chest X-ray. During my training, I learned that high-energy radiation (ie: chest X-ray) has smaller fast moving photons causing less cellular DNA damage due to size and speed. On the other hand, low-energy (low-dose) radiation (ie: mammography) has larger, slower moving photons which can and do cause double strand breaks within the DNA of susceptible cells; damage that cannot be repaired by the cell. A recent report discusses the impact of radiation on young women with genetic mutations: Radiation May Increase Breast Cancer Risk. Young women who have a genetic predisposition to breast cancer may benefit from MRI or other non-radiation type screening. According to the Journal of the National Cancer Institute (2011), a mammogram uses 4 mSv of radiation versus the 0.02 mSv from the average chest X-ray. 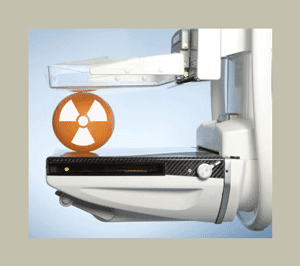 Thus, a mammogram delivers 200 times more radiation than a typical chest X-ray. Obviously,the effects of the x-ray are different and perhaps should not be compared. It is based on the higher-energy radiation emission (radiation from the atomic bomb or a chest X-ray). This risk model is crude in that it was developed before the discovery of DNA and before a comprehensive understanding of radiotoxicity and genotoxicity. Unfortunately, Sayer Ji goes on to state, "With the advent of non-ionizing radiation based diagnostic technologies, such as thermography, it has become vitally important that patients educate themselves about the alternatives to X-ray mammography that already exist." Anytime I read the words "thermography" and "alternative" in the same sentence, my stomach turns. I do not want to mislead you about thermography and what it offers and so, no comparison of the two technologies should be made. They are completely different in their utility and proper role. Recognize that my reason for sharing this information with you is to alert you to the biological affects of low-energy (low-dose) radiation from mammography and that what you may be told about how much radiation your breasts are exposed to during this procedure may not be the truth. I encourage you to read Sayer Ji's essay and even print it out for your practitioner who may tell you that the amount of radiation in a mammogram is the same as a flight to Denver or spending a week at a high altitude. You might consider printing Sayer's article for them to read and consider. Please pass this along to other women regardless of their age. Educate them on how thermography can offer them the chance to assess their current breast health status and that there are numerous ways to improve upon it if needed and monitor it yearly for early warning signs. Be sure to let them know that breast DITI is not a replacement for mammography, but that it empowers you to take charge of your health and play a more active role in maintaining or regaining optimal wellness. 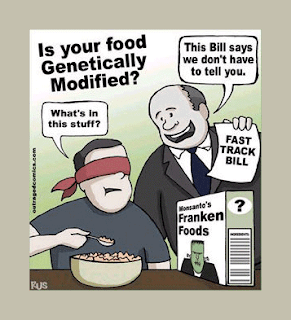 Lastly, although the information in this post is important, please be sure to read about the equally important topic of GMO food labeling in my next post entitled "Frankenfoods: We Have the Right to Know." The impact of GMO foods on our health as well as on the environment will be the major focus of my October newsletter and blog. It is imperative that we alert as many people as we can to the importance of CA Proposition 37 before the November 6th election! Don't forget to subscribe to our blog and click here to 'Like' and follow Proactive Health Solutions, LLC on Facebook! Both of these resources will allow you to stay informed with current, relevant information about the preventative DITI technology, as well as other mainstream health, wellness and prevention issues.